Garbage pickup and recycling days in Benton are every Thursday. (If a holiday falls on a Thursday, pickups will be made on Saturday.) Garbage cans and recycle bins should be at curbside by 6:00 A.M. Weekly garbage pickup is for normal household refuse. Please do not exceed two 55 gallon cans or four 35 gallon cans a week. Weight limit is 50 lbs per can (must be able to be picked up by one person). If you have a large quantity of garbage, please arrange for a separate pickup with a vendor of your choice at your cost. Recycling is a simple thing that each of us can do to help prevent useful material resources from being wasted, to help reduce the consumption of raw materials, and to help reduce the use of energy and its byproducts. 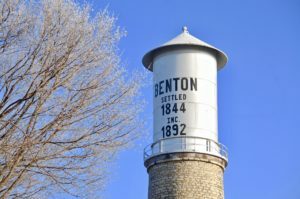 Benton has been a recycling community for many, many years. Each household is provided a recycling bin. The bins remain the property of the Village and stay with the home when it changes ownership or rental. Additional bins are available for a charge. Contact the Village Office at (608) 759-3721. Print the Recycling Information brochure.